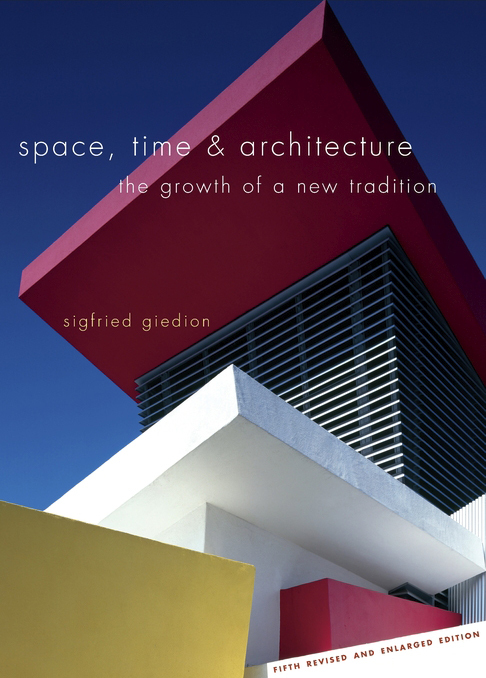 Recently reading Reto Geiser's excellent Giedion and America prompted me not only to pull down my copy of Sigfried Giedion's Space, Time and Architecture from my shelf, but also to swap my musty fourth edition from 1962 for a cleaner copy of the revised and enlarged fifth edition, which was released in 1967 (one year before Giedion's death) and was printed most recently by Harvard University Press in 2009, in paperback form. Originally published in 1941, Space, Time and Architecture came out of a series of lectures the Swiss art historian delivered at Harvard in 1938 and 1939. The Charles Eliot Norton Lectures enabled Giedion to explore the contemporary architecture of (primarily) Europe through an examination of historical precedents. Giedion saw history as "not a compilation of facts, but an insight into a moving process of life." By "examining certain specific events intensively...in the manner of a close-up," he honed in on a "space-time" conception of architecture that had Walter Gropius, Le Corbusier, Alvar Aalto, and (by the fifth edition) Jørn Utzon as its poster boys. 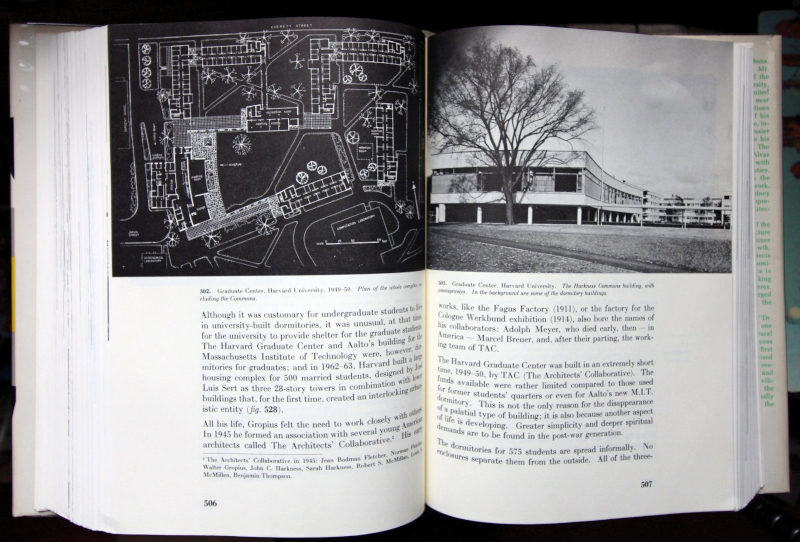 CIAM (the International Congress for Modern Architecture) was also an important player, though in regards to city planning, of which Giedion devotes three chapters, or about 170 pages of his nearly 900-page tome. 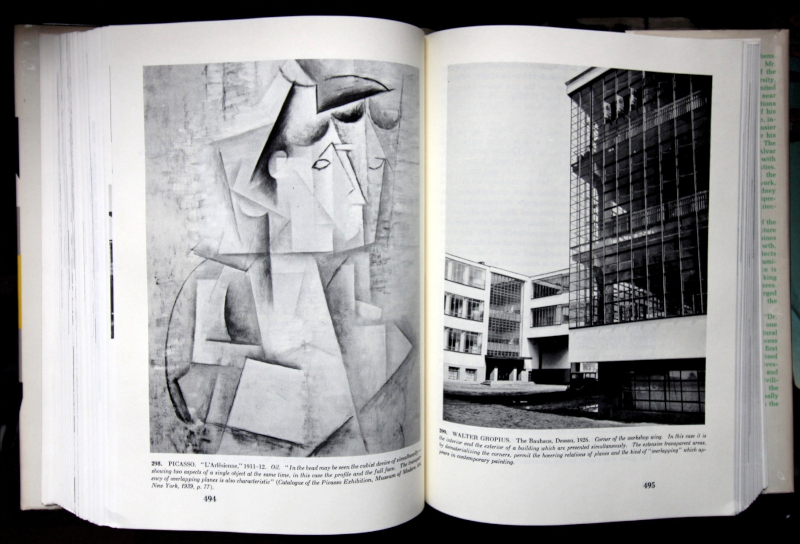 Giedion was good friends with Gropius and served, with his longtime colleague Jaqueline Tyrwhitt, who was integral to the production of Space, Time and Architecture, as CIAM secretary; meaning his classic book was influenced by, and an extension of, the network he maintained before and after World War II, both in Europe and the United States. One aspect of Giedion's dated yet long-influential masterpiece that Geiser delves into at length in his book is its layout. 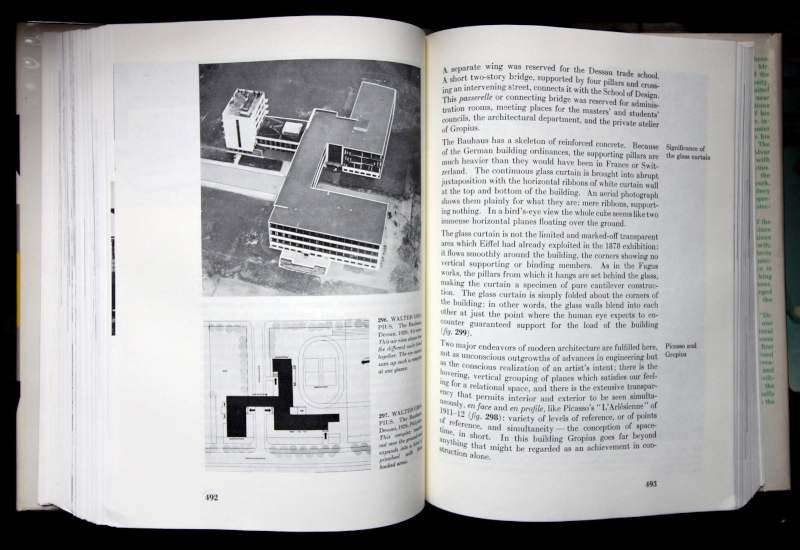 Before Space, Time and Architecture's initial publication on the leading edge of WWII, architecture and other illustrated books separated text and illustrations, often the first coming before and referencing the latter. (This was also the case after the war, if a book such as Henry LaFarge's Lost Treasures of Europe from 1946 is any indication; it has 30 pages of text that function as captions to the 427 photographs that follow.) 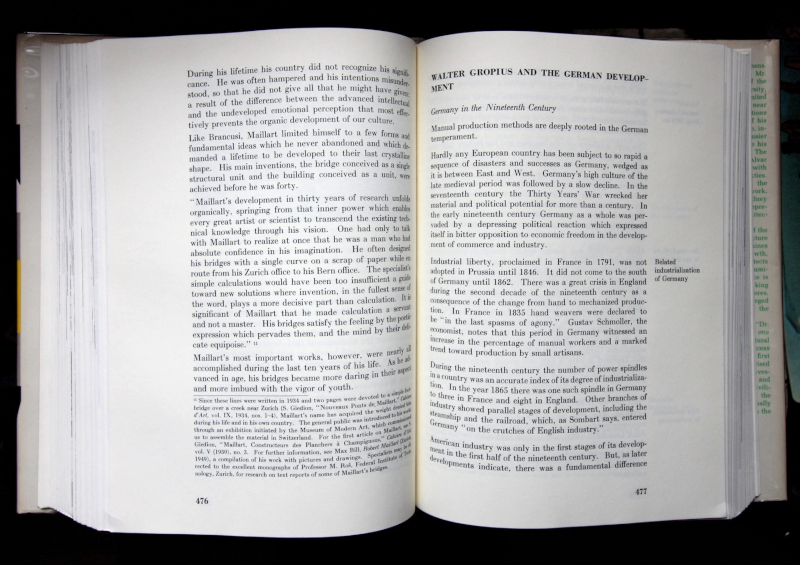 Giedion's integration of text (including footnotes and marginalia) and images in a seamless flow throughout his book would go on to become the norm in architecture books, displacing the traditional separation of words and images that was done as much out of habit as out of the limitations of editors and printers. In this regard, Space, Time and Architecture, though not the only book taking this approach, must have been shocking at the time both for its content and its appearance. Giedion's book also incorporates the juxtaposition of seemingly disparate images side by side, something he did in his lectures -- something he used to further elucidate his "space-time" arguments.